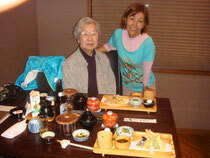 Wonderful dinner with mother. It was Mother's Day, but mother's treat!! Give thanks mother! ' Sashimi' is best in Beppu, I bet.